91% of cyber attacks start with a phishing email. From CEO fraud to ransomware, these attacks are a big problem for businesses. 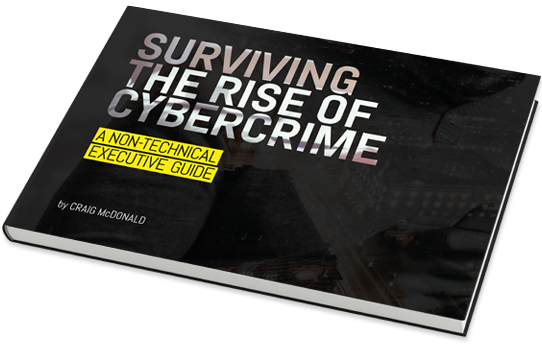 Download our free executive guide, Surviving the Rise of Cybercrime, by Craig McDonald. The guide provides a non-technical insight into cybersecurity for time-poor executives. In less than 60 minutes, gain an understanding of cybersecurity and what it means for your organisation. Understand the threat to your business with real-world examples, and become familiar with cybersecurity terminology. "Effective cybersecurity has become a key foundation for the digital transformation initiatives of government and businesses. This guide provides a clear assessment of the threat, while providing a set of very practical steps that executive leaders can take to build a modern, resilient platform for their business innovation." “Cybercrime is a serious and growing business risk. Building an effective cybersecurity culture within an organisation requires directors and executives to lead by example. 'Surviving the Rise of Cybercrime' is a must-read for directors and executives across business and in government and provides strong foundations for leaders determined to address cyber risk."